Unexpected is this post, because I hadn't planned it in the least, but you know: love at first sight is always unexpected, and this was no exception. The passages contained in the book have been selected by Anna Maria Lorusso. The very first edition of this book was the idea of Olivetti, they had the habit to gift their most prestigious customers with limited book editions conceived and printed on purpose for them: it was the 80’s, between 1982 and 1984 and, as Tullio Pericoli himself explains in the foreword, he was having a difficult transition: divided between illustrations for papers and art galleries, between the illustrator and the painter. The story he tells is charming, mostly interesting the way he explains how much, illustrating this book, helped him regaining a final artistic unity: up to that moment in fact, the expressive dichotomy that had kept the illustrator apart from the painter, as if they had to be separated from the start, had precluded to him to find a unitary expression. 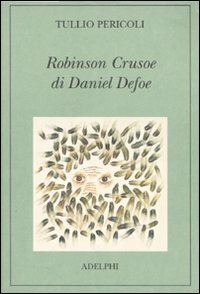 As he tells, Robinson Crusoe somehow included the two expressive worlds that, back then, were the object of his artistic research: man, the subject for his works in the papers, and nature, his favourite topic in his paintings. In Robinson Crusoe those two elements merge and become almost confused, this aggregation process is very clear in the tables that illustrate the novel. In this new version by Adelphi, we find a great number of illustrations that weren't published in the original printed by Olivetti, showing an extremely interesting research. My only regret, if a fault has to be found, is the almost total absence of Friday that, in the novel, still has some importance: I would have greatly enjoyed to see his equal representation as Friday is part of the island as much as trees, fish, birds and green peaks. Friday is the wild Caliban from Shakespeare's The Tempest, he is the perfect point of collision and fusion between man and nature: he represents the archetype of the wild to which a whole literary genre is devoted and, to my opinion, it deserved more attention. It is true that Pericoli explains how much, to him, Robinson and the Island were the two absolute characters of the novel and the perfect mean to complete the merging process between paper and art gallery, illustrator and painter, man and nature, gifting the first with characteristics from the other and vice-versa he thus obtained his purpose. True as well that in Defoe's novel, though as I just said he has some importance, Friday has a minor role, much less important if compared with the one Michel Tournier gives him in his wonderful novel Vendredi ou les limbes du Pacifique, where he has a supporting role, if not that of Robinson's own conscience. In all cases this absence doesn't actually irreparably alter the beauty of this book that, to me, remains a masterpiece of rare beauty. Also, publisher Corraini, has just published a brand new book tracing the evolution of his works devoted to landscapes, whose title is “L'Infinito Paesaggio”, you can find it here.